Most of the area falls within the Peak District National Park, whose designation in 1951 made it the first national park in the British Isles. An area of great diversity, it is conventionally split into the northern Dark Peak, where most of the moorland is found and whose geology is gritstone, and the southern White Peak, where most of the population lives and where the geology is mainly limestone-based. Proximity to the major cities of Manchester and Sheffield and the counties of Lancashire, Greater Manchester, Cheshire, Staffordshire and South and West Yorkshire, coupled with easy access by road and rail, have contributed to its popularity. The Peak District forms the southern end of the Pennines and much of the area is uplands above 1,000 feet (300 m), with a high point on Kinder Scout of 2,087 feet (636 m). Despite its name, the landscape generally lacks sharp peaks, being characterised by rounded hills and gritstone escarpments (the "edges"). The area is surrounded by major conurbations, including Huddersfield, Manchester, Sheffield, Derby and Stoke-on-Trent. The National Park covers 555 square miles of Derbyshire, Staffordshire, Cheshire, Greater Manchester and South and West Yorkshire, including the majority of the area commonly referred to as the Peak. 12% of the Peak District National Park is owned by the National Trust, a charity which aims to conserve historic and natural landscapes. It does not receive government funding. The three Trust estates (High Peak, South Peak and Longshaw) include the ecologically or geologically significant areas of Bleaklow, Derwent Edge, Hope Woodlands, Kinder Scout, Leek and Manifold, Mam Tor, Dovedale, Milldale and Winnats Pass The Peak District National Park Authority directly owns around 5%, and other major landowners include several water companies. The Peak District has been inhabited from the earliest periods of human activity, as is evidenced by occasional finds of Mesolithic flint artefacts and by palaeoenvironmental evidence from caves in Dovedale and elsewhere. There is also evidence of Neolithic activity, including some monumental earthworks or barrows (burial mounds) such as that at Margery Hill. In the Bronze Age the area was well populated and farmed, and evidence of these people survives in henges such as Arbor Low near Youlgreave, or the Nine Ladies Stone Circle at Stanton Moor. In the same period, and on into the Iron Age, a number of significant hillforts such as that at Mam Tor were created. Roman occupation was sparse but the Romans certainly exploited the rich mineral veins of the area, exporting lead from the Buxton area along well-used routes. There were Roman settlements, including one at Buxton which was known to them as "Aquae Arnemetiae" in recognition of its spring, dedicated to the local goddess. 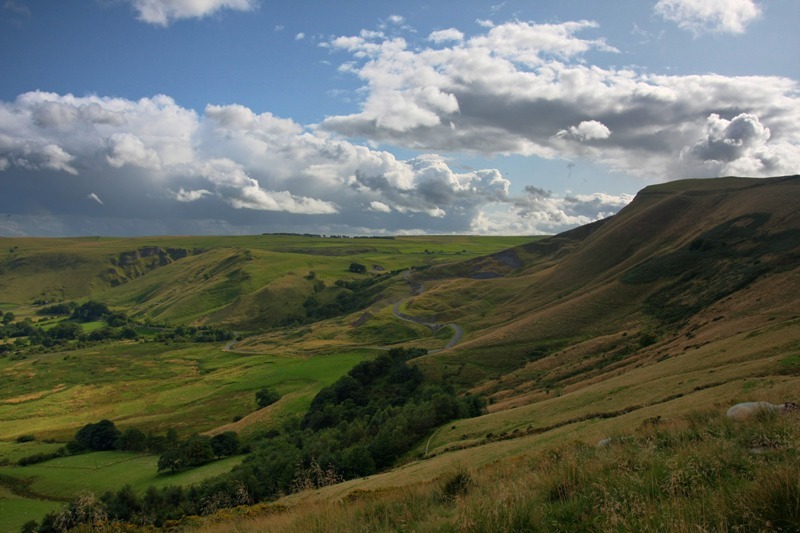 The Peak District is formed almost exclusively from sedimentary rocks dating from the Carboniferous period. They comprise the Carboniferous limestone, the overlying Gritstone and finally the Coal Measures, though the latter occur only on the extreme margins of the area. In addition there are infrequent outcrops of igneous rocks including lavas, tuffs and volcanic vent agglomerates. The central and southern section of the Peak District where the Carboniferous limestone is found at or near the surface, is known as the White Peak in contrast to the Dark Peak which is characterised by Millstone Grit outcrops and broad swathes of moorland. He was referring to Longdendale, and the upper valley of the River Etherow. The western side of the Peak District is drained by the rivers Etherow, Goyt, and Tame, which are tributaries of the River Mersey. The north east is drained by tributaries of the River Don, itself a tributary of the Yorkshire Ouse. Of the tributaries of the River Trent, that drain the south and east, the River Derwent is the most prominent. It rises in the Peak District on Bleaklow just east of Glossop and flows through the Upper Derwent Valley with its three reservoirs, the Howden Reservoir, Derwent Reservoir and Ladybower Reservoir. The River Noe and the River Wye are tributaries. The River Manifold and River Dove, rivers of the south west whose sources are on Axe Edge Moor, also flow into the Trent, while the River Dan flows into the River Weaver. In medieval and early modern times the land was mainly agricultural, as it still is today, with sheep farming, rather than arable, the main activity in these upland holdings. However, from the 16th century onwards the mineral and geological wealth of the Peak became increasingly significant. - those craggy hills whose bowells are full of mines of all kinds off black and white and veined marbles, and some have mines of copper, others tinn and leaden mines, in w[hi]ch is a great deale of silver. Coal measures occur on the western and the eastern fringes of the Peak District, and evidence of past workings can be found from Glossop down to The Roaches, and from Stocksbridge to Baslow. Mining started in medieval times and was at its most productive in the 18th and early 19th centuries, in some cases continuing into the early 20th century. The earliest mining took place at and close to outcrops and miners eventually followed the seams deeper underground as the beds dipped beneath hillsides. At Goyt's Moss and Axe Edge, deep seams were worked and steam engines raised the coal and dewatered the mines Coal from the eastern mines was used in lead smelting, and coal from the western mines for lime burning. Lead mining peaked in the 17th and 18th centuries; high concentrations of lead have been found in the area dating back from this period, as well as discovering peat on Kinder Scout suggesting that lead smelting occurred Lead mining began to decline from the mid-19th century, with the last major mine closing in 1939, though lead remains a by-product of fluorite, baryte and calcite mining. Not all mines were deep underground; Bell pits were a cheap and easy way at getting at an ore that lay close to the surface of flat land. A shaft was sunk into the ore and enlarged at the bottom for extraction. The pit was then enlarged further until it became unsafe or worked out, then another pit would be sunk adjacent to the existing one. Fluorite or fluorspar is called Blue John in the Peak District, the name allegedly coming from the French Bleu et Jaune which describes the colour of the bandings. Blue John is now scarce, and only a few hundred kilograms are mined each year for ornamental and lapidary use. The Blue John Cavern in Castleton is a show cave; mining still takes place in the nearby Treak Cliff Cavern. Industrial limestone quarrying for the manufacture of soda ash started in the Buxton area as early as 1874. In 1926 this operation became part of ICI Large-scale limestone and gritstone quarries flourished as lead mining declined, and remain an important if contentious industry in the Peak district. Twelve large limestone quarries operate in the Peak - Tunstead near Buxton is one of the largest quarries in Europe Total limestone output was substantial, at the 1990 peak, 8.5 million tonnes was quarried. Textiles have been exported from the Peak District for hundreds of years. Even as early as the 14th century, the area traded in unprocessed wool. here was a number of skilled hand spinners and weavers in the area. By the 1780s, inventors such as Richard Arkwright developed machinery to produce textiles more quickly and to a higher standard. The early mills were narrow and low in height, of light construction, powered by water wheels and containing small machines. Interior lighting was by daylight, and ceiling height was only 6–8 ft. These Arkwright type mills are about 9 feet (2.7 m) wide. The Peak District was the ideal location, with its rivers and humid atmosphere. The local pool of labour was quickly exhausted and the new mills such as Litton Mill and Cressbrook Mill in Millers Dale brought in children as young as four from the workhouses of London as apprentices. With the advance of technology, the narrow Derbyshire valleys became unsuited to the larger steam driven mill, but the Derbyshire mills remained, and continued to trade in finishing and niche products. The market town of Glossop benefitted from the textile industry. The town's economy was linked closely with a spinning and weaving tradition which had evolved from developments in textile manufacture during the Industrial Revolution. Until World War I, Glossop had the headquarters of the largest textile printworks in the world. In the 1920s, the firm was refloated on the easily available share capital; thus it was victim of the stockmarket crash. Their product lines becoming vulnerable to the new economic conditions, and resulted in the industry's decline. The streams of the Peak District have been dammed to provide headwater for numerous water driven mills, weirs have been built across the rivers for the same purpose. Though there is no canal within the National Park boundary, waters from the Dark Peak fed the Ashton Canal, and Huddersfield Narrow Canal. Waters from the White Peak fed the Macclesfield Canal. The Peak Forest Canal was built to bring lime from the quarries at Dove Holes for the construction industry. The canal terminated at Bugsworth and the journey was completed using the Peak Forest Tramway. The large reservoirs along the Longdendale valley known as the Longdendale Chain were designed in the 1840s and completed in February 1877. They provided compensation water to ensure a continuous flow along the River Etherow which was essential for local industry, and provided pure water for Manchester. The Upper Derwent Valley reservoirs were built from the mid 20th century onward to supply drinking water to the East Midlands and South Yorkshire. The first roads in the Peak District were constructed by the Romans, although they may have followed existing tracks. The Roman network is thought to have linked the settlements and forts of Aquae Arnemetiae (Buxton), Chesterfield, Ardotalia (Glossop) and Navio (Brough and Shatton), and extended outwards to Danum (Doncaster), Manucium (Manchester) and Derventio (Little Chester, near Derby). Parts of the modern A515 and A53 roads south of Buxton are believed to run along Roman roads. Packhorse routes criss-crossed the Peak District in the Medieval era, and some paved causeways are believed to date from this period, such as the Long Causeway along Stanage Edge. However, no highways were marked on Christopher Saxton's map of Derbyshire, published in 1579. Bridge-building improved the transport network; a surviving early example is the three-arched gritstone bridge over the River Derwent at Baslow, which dates from 1608 and has an adjacent toll-shelter. Although the introduction of turnpike roads (toll roads) from 1731 reduced journey times, the journey from Sheffield to Manchester in 1800 still took 16 hours, prompting Samuel Taylor Coleridge to remark that "a tortoise could outgallop us!" From around 1815 onwards, turnpike roads both increased in length and improved in quality. An example is the Snake Pass, which now forms part of the A57, built under the direction of Thomas Telford in 1819–21; the name refers to the crest of the Duke of Devonshire. The Cromford Canal opened in 1794, carrying coal, lead and iron ore to the Erewash Canal. Within several years, the improved roads and the Cromford Canal both saw competition from new railways, with work on the first railway in the Peak commencing in 1825. Although the Cromford and High Peak Railway (from the Cromford Canal at High Peak Junction to Whaley Bridge) was an industrial railway, passenger services soon followed, including the Woodhead Line (Sheffield to Manchester via Longdendale) and the Manchester, Buxton, Matlock and Midlands Junction Railway. You enterprised a railroad through the valley, you blasted its rocks away, heaped thousands of tons of shale into its lovely stream. The valley is gone, and the gods with it; and now, every fool in Buxton can be at Bakewell in half-an-hour, and every fool in Bakewell at Buxton. The Manchester, Buxton, Matlock and Midlands Junction Railway is now closed between Rowsley and Buxton where the trackbed forms part of the Monsal Trail. The Cromford and High Peak Railway is now completely shut, with part of the trackbed open to the public as the High Peak Trail. Another disused rail line between Buxton and Ashbourne now forms the Tissington Trail. The landscapes of the Peak District have formed an inspiration to writers for centuries. Various places in the Peak District have been identified by Ralph Elliott and others as locations in the 14th century poem Sir Gawain and the Green Knight; Lud's Church for example, is thought to be the Green Chapel. Key scenes in Jane Austen's 1813 novel Pride and Prejudice are set in the Derbyshire Peak District. Peveril of the Peak (1823) by Sir Walter Scott is a historical novel set at Peveril Castle, Castleton during the reign of Charles II. William Wordsworth was a frequent visitor to Matlock; the Peak inspired several of his poems, including an 1830 sonnet to Chatsworth House. The village of Morton in Charlotte Brontë's 1847 novel Jane Eyre is based on Hathersage, where Brontë stayed in 1845, and Thornfield Hall might have been inspired by nearby North Lees Hall. Snowfield in George Eliot's first novel Adam Bede (1859) is believed to be based on Wirksworth, where her uncle managed a mill; Ellastone (as Hayslope) and Ashbourne (as Oakbourne) are also featured. Beatrix Potter, the author of Peter Rabbit, used to visit her uncle Edmund Potter at his printworks in Dinting Vale. She used cloth patterns from his Pattern Sample book to dress her characters. Mrs Tiggywinkle's shawl, in The Tale of Mrs. Tiggy-Winkle, is based on pattern number 222714. Children's author Alison Uttley (1884–1976) was born at Cromford; her well-known novel, A Traveller in Time, set in Dethick, recounts the Babington Plot to free Mary, Queen of Scots, from imprisonment. Crichton Porteous (1901–91) set several books in specific locations in the Peak; Toad Hole, Lucky Columbell and Broken River, for example, are set in the Derwent Valley. More recently, Geraldine Brooks's first novel, Year of Wonders (2001), blends fact and fiction to tell the story of the plague village of Eyam, which also inspired Children of Winter by children's novelist, Berlie Doherty (b. 1943). Doherty has set several other works in the Peak, including Deep Secret, based on the drowning of the villages of Derwent and Ashopton by the Ladybower Reservoir, and Blue John, inspired by the Blue John Cavern at Castleton. Many works of crime and horror have been set in the Peak District. The Terror of Blue John Gap by Sir Arthur Conan Doyle (1859–1930) recounts terrible events at the Blue John mines, and Sherlock Holmes investigates the kidnapping of a child in the region in The Adventure of the Priory School. Many of the horror stories of local author Robert Murray Gilchrist (1878–1916) feature Peak settings. More recently, Stephen Booth has written a series of crime novels set in various real and imagined Peak locations, while In Pursuit of the Proper Sinner, an Inspector Lynley mystery by Elizabeth George, is set on the fictional Calder Moor. Other writers and poets who lived in or visited the Peak include Samuel Johnson, William Congreve, Anna Seward, Jean-Jacques Rousseau, Lord Byron, Thomas Moore, Richard Furness, D. H. Lawrence, Vera Brittain, Richmal Crompton and Nat Gould. The landscapes and historic houses of the Peak are also popular settings for film and television. In recent adaptations of Pride and Prejudice, Longnor has featured as Lambton, while Lyme Park and Chatsworth House have stood in for Pemberley. Haddon Hall not only doubled as Thornfield Hall in two different adaptations of Jane Eyre, but has also appeared in several other films including Elizabeth, The Princess Bride and The Other Boleyn Girl. The long-running television medical drama Peak Practice is set in the fictional village of Cardale in the Derbyshire Peak District; it was filmed in Crich, Matlock and other Peak locations.